We’re thrilled to announce that the MadWorld 2019 Dublin Call for Presentations is now open! The conference returns to Europe next year to Dublin, Ireland, and we’re looking for submissions from experienced users and industry experts with a passion to share their recent successes, practical advice, and best practices. 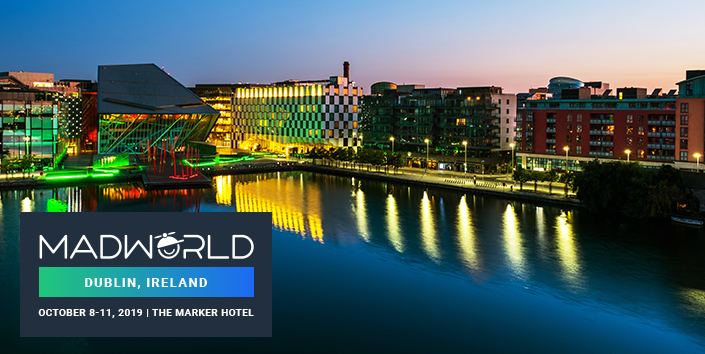 MadWorld, the premier technical communication and content strategy conference, will take place at the Marker Hotel in Dublin, from October 8-11, 2019. The annual conference provides an excellent opportunity for industry experts and professionals to showcase their skills and expertise to a wide audience. We’ll select 20 main conference sessions and eight advanced training workshop sessions from more than 15 speakers with a variety of backgrounds, skills, industries and areas of expertise. Why Submit for MadWorld 2019 Dublin? MadWorld is a great opportunity to showcase professional skills and experience to the MadCap Software user community. In the past, speakers have presented on best practices, success stories, case studies, or advanced techniques on MadCap Flare. Looking for inspiration? Take a look at the MadWorld 2018 Europe page to see what speakers have presented at the debut conference. Speakers selected to present at MadWorld 2019 Dublin will have their conference and workshop registration covered, along with hotel accommodations for three nights (four for workshop speakers). Be descriptive. When submitting your abstract, try to be as detailed as possible. Describe the unique challenges that you’re solving, and how you’ve been able to succeed. The more descriptive you are, the easier it will be to understand your core objectives. Hone in on a skill level. From new users to advanced, high-level experts, MadWorld attendees come from a wide range of skill levels. When crafting your submissions, keep in mind the target audience, and which attendees would be interested in your topic. Showcase results and takeaways. Are there specific product features that are used to drive results? Any tangible assets or knowledge that attendees can obtain from your session? Highlight any clear takeaways and concrete examples that go along with your submission, such as demos, how-to’s, or solutions to issues. Send your best, thought-provoking topics. We’re looking for sessions that are highly engaging, compelling, and highlights unique use cases and experiences. We showcase the best of the best, so send us your best practices, case studies, and advanced techniques we’re all dying to learn more about. Session ideas should offer actionable takeaways and apply across industry verticals. While specific session ideas are not outlined, we’re looking for a rich variety of session content, advanced sessions geared toward experienced users, and sessions that are unique, i.e. have not been presented at a previous conference. Interested in submitting your ideas for MadWorld 2019 Dublin? Submit your presentations before the deadline on Friday, January 11, 2018. Speakers who have been selected will be notified starting late February. For all the details on our Call for Presentations, visit the MadWorld page here.